Buy 4 pkg, Get 1 FREE! Free item will be of equal or lesser value to lowest price purchase item. Fuji IX GP is a strong, wear resistant packable glass ionomer restorative. Use for amalgam/composite/compomer alternative in pediatric or geriatric restorations, intermediate restorative, long-term temporary. Releases fluoride. 6-minute setting time. Contains: 15g A2 powder, 6.4ml liquid, mixing pad, powder scoop. Fuji IX GP earned 4.0 stars out of a possible 5.0. Sets almost as fast as a dual-cured. Amazing adhesion. 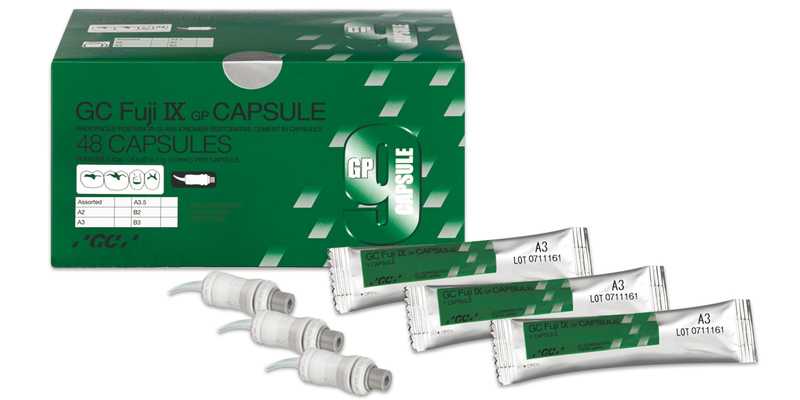 Hand-mixed or capsule packaging. Does not fluoresce. The fast set version is very fast – this is not a product for leisurely dentistry. None of its Vita shades even come close to matching. Terrific for emergency fracture repairs and in pediatric applications and core buildups, especially when you can’t establish a perfectly isolated field for a composite.